Hello everybody, I'm not a CCIE but I would appreciate your help. 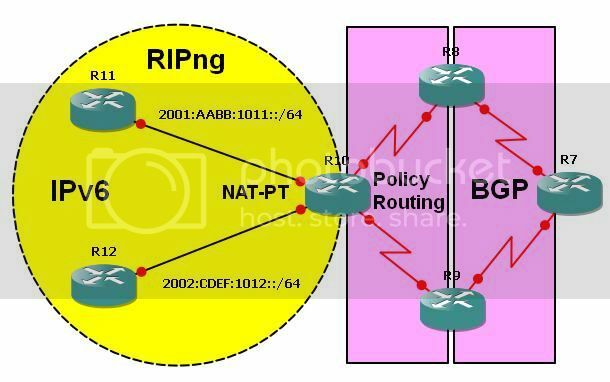 I have implemented NAT-PT on R10 and a policy routing to prefer R8 using proactive testing (IP SLA and a track object), but then I noticed that R10 can still reach R9 using R7. I tried everything to prevent passing through R7, but it just won't work.. I tried route tagging, access lists, policy routing, etc.. So the first thing, how can I force R10 and the IPv6 world to use R8 only as long as it is up, and the second thing is when I shut down the interface on R8, R10 uses R9 but the IPv6 routers give me UUUUU although I have static route on R9 to send back to the IPv6 routers.. Thank you again.. Your help is greatly appreciated.